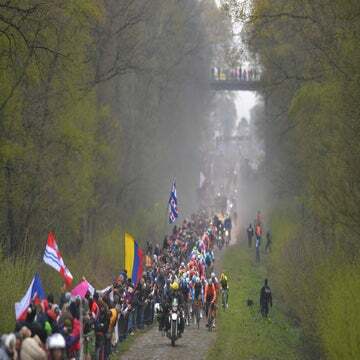 COMPIEGNE, France (VN) — Fans crowded around Joseph Areruya as he walked through the courtyard of the Palais de Compiégne, the host venue for Paris-Roubaix’s grand depart. They snapped photos with Areruya and asked him to sign paper trading cards with his face printed on the front. WorldTour stars typically receive most of the attention on the eve of the race known as The Hell of the North. Areruya, who rides for the lesser-known Pro Continental team Delko Marseille Provence, had a spotlight shown on him due to his place in the race’s history. The 22-year-old became the first Rwandan cyclist to start Paris-Roubaix. In fact, he is the first black African rider to participate in the race. Areruya’s start in Paris-Roubaix marks yet another milestone in his young and decorated cycling career. Areruya is a product of Team Rwanda and the Team Africa Rising cycling projects, the cycling development projects founded by retired American rider Jonathan Boyer. He joined the team as a teenager, after Team Rwanda’s initial five riders— Adrien Niyonshuti, Nathan Byukusenge, Abraham Ruhumuriza, Rafiki Uwimana, and Nyandwi Uwase—became celebrities across Rwanda for participating in international races. Areruya followed in the footsteps of Rwanda’s trailblazers, winning the Tour of Rwanda in 2017 and securing a roster spot on Dimension Data’s U23 development squad. Areruya then surpassed his predecessors with a series of impressive accolades. In 2017 he became the first Rwandan rider to win a stage of the U23 Giro d’Italia. In 2018 he won Gabon’s La Tropicale Amissa Bongo, and the Tour de l’Espoir in Camaroon. The victories helped Areruya secure the Best African Cyclist of the Year award in 2018—he’s the first Rwandan winner since the award was launched in 2011. Areruya said his start in Paris-Roubaix represents a lifelong goal. Like other pro teams, Areruya and his Delko squad pedaled over the cobblestones on Thursday morning to perform a reconnaissance over the rough roads. 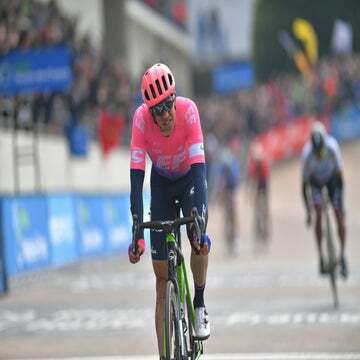 Areruya said simply riding over the pave presented a challenge. 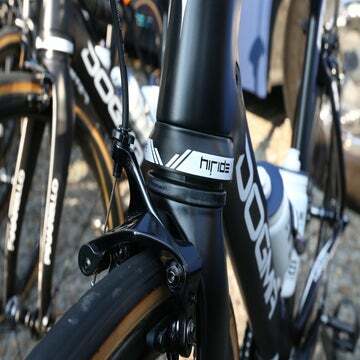 He has ridden over cobbles during the Tour of Rwanda, he said, but the Roubaix pavé presented a much greater challenge. He was confident, however, that he could make it to the finish line on Sunday. Areruya bases himself in France, and he travels back to Rwanda throughout the year to see friends and family. After his experience at Paris-Roubaix, he will likely have to sign more autographs and pose for more photos back home. “I am hoping to tell everyone about my race,” Areruya said.